Heat the oil in a deep frying pan. Add the onion and fry gently for about 20 minutes until tender. Add the ginger and pepper and fry for a minute or so. Sprinkle in the cardamom seeds and spices and fry for another minute. Stir in the coconut milk, stock, sugar and lemon juice. Season with salt and pepper and simmer over a low heat for about 5 minutes until the sauce has reduced slightly. Stir in the almonds and prawns and cook over a high heat for about 3 minutes, or until the prawns have turned pink and are cooked through. Garnish with coriander leaves and serve at once with rice and naan bread. The sauce can be made a day ahead, adding the almonds and prawns when you reheat on the hob. 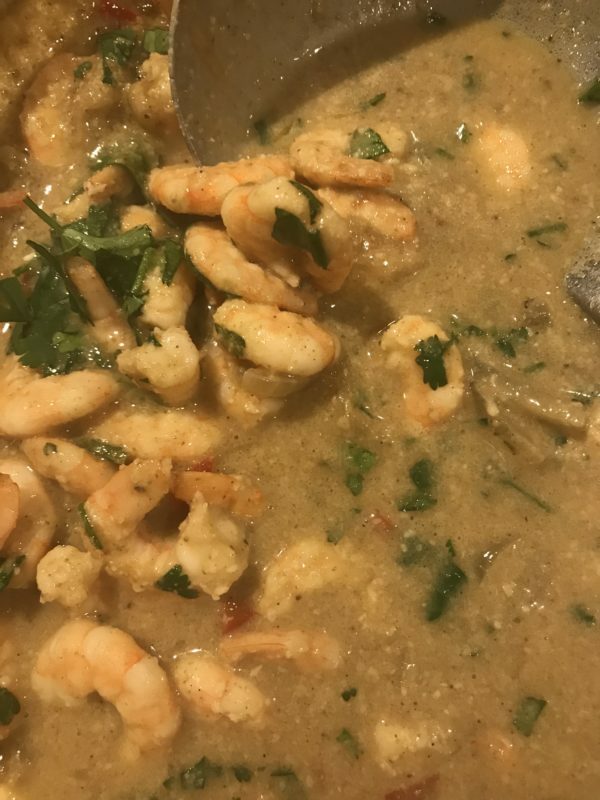 When adding the prawns make sure you only just cook them through and then take them off the heat as they will continue cooking and you don't want to overcook them.